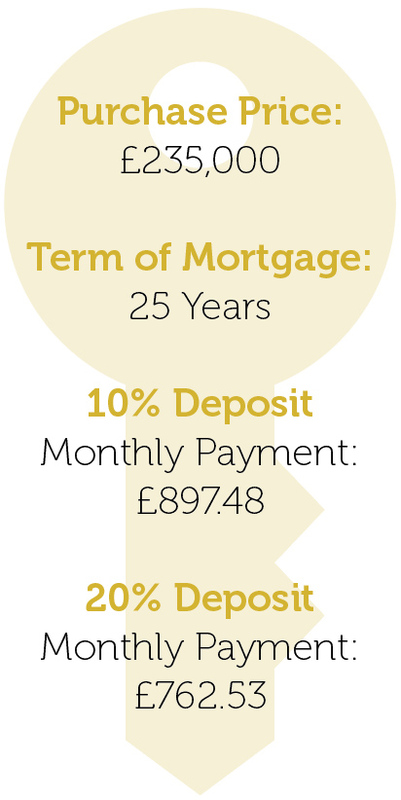 Buying a new property does not need to be daunting with our step by step guide. New Build properties present buyers with more choice and peace of mind. One of the main benefits of purchasing a new home off plan is the ability to select the plot or property suited to your individual requirements. At Canonmills Garden there is a scaled model and floor plans to make it easier to choose the orientation of your property. The ability for you to choose your property, coupled with the peace of mind you get from buying property built to the latest specification, more energy efficient and the comfort you receive from the warranties make buying a new home at Canonmills Garden even more appealing. If you need to, we suggest that you to speak with an independent financial advisor to understand how much you can comfortably afford to spend on your new home. At Canonmills Garden, we work with a trusted network of financial advisors that can assist you throughout the mortgaging process. There are many factors to consider when choosing a new home, our experienced Sales Team will help you find the home that’s just right for you. You will be asked to instruct a Scottish solicitor, provide ID for anti-money laundering and then pay a reservation fee of £500. Once paid and upon receipt of signed reservation form your chosen property will be taken off the market. Once you’ve reserved your new home, you then have 21 days - from the date your solicitor receives the offer - to conclude legal missives. 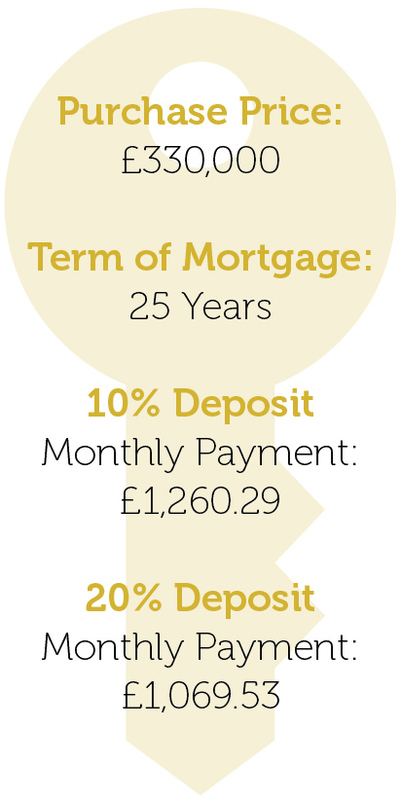 On conclusion of missives you are required to pay a further 2.5% of the asking price as a non-refundable deposit. Once missives are concluded you’ll be able to personalise your new property to make it feel more like home. The level of personalisation is dependent on the build programme and completion of the property. Please ask our Sales Team to learn more about cut off dates. Around a week before you move in we will walk you round. It’s a great opportunity to find out how everything works, and identify anything that needs done before you get the keys. The completion day is the day you will have been waiting for, when your solicitor transfers the remainder of the funds for the property and upon confirmation of this we will be able to provide you with the keys to your new home. Repaying your mortgage:When you take out a mortgage you agree to repay all the money that you owe. Even if you pay a Higher Lending Charge, you are still responsible for the money you owe, including any shortfall. If you fall behind significantly with your mortgage payments, an independent financial advisor will work with you to help you manage your circumstances and arrears. However, we may have to repossess your property and sell it to recover any money you owe. If your property is repossessed, please note that the sale may not achieve the amount sufficient to cover your outstanding mortgage; if this is the case it will result in a shortfall. 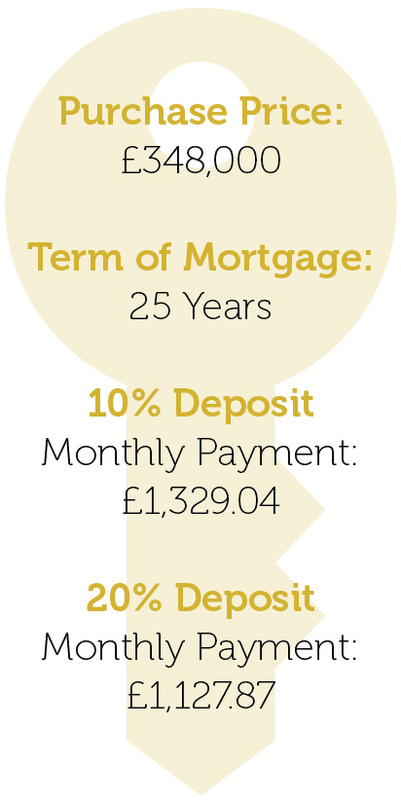 Terms & Conditions:The example mortgage calculations/payments are provided for guidance only. Please consult with an Independent Financial Advisor for mortgage advice. The actual amount you pay will depend upon your personal circumstances. 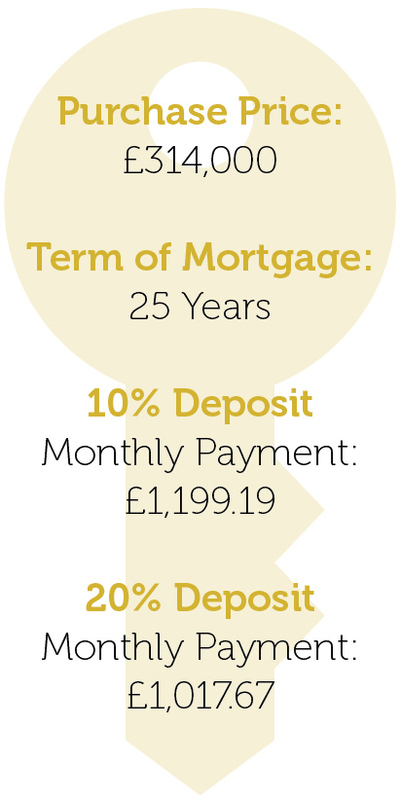 This is usually calculated on your annual income of £ - , a deposit of £ - and assuming you have a good credit rating you will qualify for a mortgage.